This is the first of a series of blog entries examining the roles of mitochondria in key biological activities. The goal of the series is to shed light on whether focusing on mitochondria can lead to new approaches for averting or curing neurological, cardiac and other diseases, and for practical interventions that extend lifespans. In my treatise ANTI-AGING FIREWALLS – THE SCIENCE AND TECHNOLOGY OF LONGEVITY originally drafted in May 2008, I discussed Mitochondrial Damage as the third-most important of some 18 theories of aging. I have also written blog entries related to mitochondrial biogenesis(ref)(ref) and to miotohormesis(ref). These have all remained highly relevant. My recent refocusing on mitochondria is due to two factors: 1. the incredible life-extension results in rats reported in the previous blog entry Buckyballs, health and longevity – state of knowledge thought to be due to a mitochondrial antioxidant intervention, and 2. an incredibly creative series of phone and e-mail exchanges over the ten days with James P Watson (Jim). Many of the bolder ideas that will put forward in this series are Jim’s. And a number of the diagrams that appear in this series were put together by Jim. When I use “we” here, I think I am speaking for both Jim and I. Just how important is mitochondrial signaling in driving disease and aging processes that may play out and manifest through DNA genetic and epigenetic processes? Have we been looking in the right places in our search for basic causes of neurological diseases? In our focus on stem cells, regenerative medicine, iPSCs and cellular senescence, have we paid enough attention to mitochondrial DNA? In ignoring mitochondrial DNA senescence, are we perhaps missing where basic action is? Is there a solid theoretical basis for seeing a mitochondrial origin to neurological diseases like Parkinson and Alzheimer’s diseases and ALS? If so, what needs to be done to further explore new therapeutic possibilities? Further, what practical interventions might be available right now? Is there a solid theoretical basis for believing that mitochondrial interventions, antioxidant or otherwise, might lead to extension of lifespans? If so, what is that evidence? To what extent has lifespan extension through mitochondrial interventions in lifeforms actually been demonstrated? What about experiments in yeast, nematodes, mice and rats? How does this possibility as applied to humans require further testing? Are mitochondria subject to replicative or stress-related senescence? If so what are the key implications of that? Can such senescence be reversed? What roles do mitochondria play in cell senescence; can a mitochondrial intervention affect the senescence process or lead to apoptosis in senescent cells? What about the roles mitochondria play in various key processes and pathways such as the unfolded protein response, apoptosis in normal and cancer cells, autophagy, etc.? Could strategies for reducing mitochondrial electron chain leakage be better ones for health and longevity than focusing on mitochondrial-active antioxidants? Do buckyballs affect electron chain leakage? What experimental work is needed to resolve outstanding questions? What new biomarkers are needed? To answer these and related questions, we draw on research from many different perspectives, in many cases on work done by researchers who do not appear to be in communication with each other. These blog entries will blog will summarize information from several independent streams of publications, collectively a large number of them. Entire schools of researchers are studying closely related processes but seem to either not know of or to ignore each other’s work. Trying to put together the pieces of the jigsaw puzzle of health, longevity and aging, sometimes we wonder if all the pieces are from the same puzzle. We nonetheless try to fit those pieces together, and in doing so hope that in doing that we will be able to surface new important insights and perspectives. In some cases we speculate on how results from different streams are related, our own efforts to contribute. It is not at all an easy process and some of our conjectures could be off-base, but the process is a very exciting one for us. 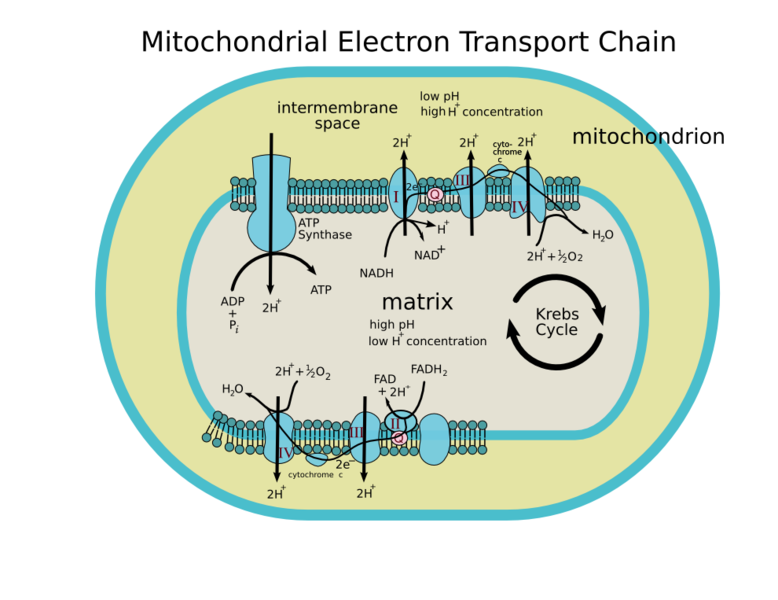 This Part 1 blog reviews basic facts about mitochondria, discusses the electron transport chain and electron leakage in mitochondria. We discuss the sroles of mitochondria in aging and genetic mutational diseases for important insights they might lead us to. 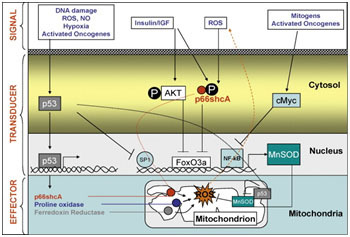 And we review and expand upon some of the material covered in previous blogs related to mitochondrial biogenesis and mitohormesis. Some of this material is basic and well known and some is derived from fairly new research. The next blog entry in this series, Mitochondria Part 2: mitochondrial pathways, diseases and aging will dig deeper and examine underlying pathway mechanisms for observed disease and aging effects. 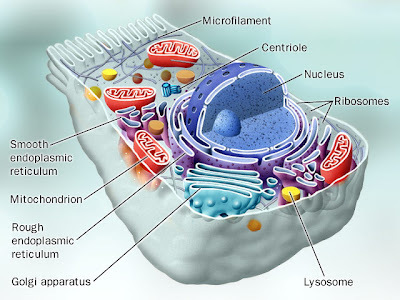 We will touch upon mitochondrial signaling and the mitochondrial UPR (unfolded protein response), into the roles of mitochondria in UPR in the endoplasmic reticulum, some of the pathways between mitochondria and the nucleus, and into signaling transport mechanisms such as microtubules and motor proteins. And we will speculate on a possible underlying mitochondrial cause common to aging and age-related neurological, cardiac and other diseases. As I now see it, a Part 3 blog entry will focus on practical interventions. It will review what is known about the impact of administration of key mitochondrial antioxidants, alpha-lipoic acid, acetyl-l-carnitine, melatonin and buckyballs in particular. And it will speculate on how research needs to be directed to answer critical outstanding questions. Mitochondria are like simple separate biological organisms, and are thought to have possibly evolved from such very long ago. In animal cells, they are in a complex set of symbiotic relationships with nuclear and other elements of the cells, relationships critical to the survival of mitochondria, the cells, the organs concerned, and the animals themselves. We believe that exploring the nature of those relationships may lead us to new insights related to diseases and aging – and may also suggest basic new health and longevity-promoting interventions. Any mtDNA an individual has is passed on only from his or her mother. mtDNA as in does not undergo recombination as in sexual reproduction. Changes to mtDNA come only from mutations, ones occuring during cell division or resulting from ROS damage. Mutations that occur in the mtDNA control region tend not to be repaired, since that region does not code for any specific product . Such mtDNA mutations may accumulate with aging. Thus, only mutations that occur in female germline cells (those that become eggs) are passed on to offspring. Electron leakage from the electron transport chain in mitochondria normally produces a low level of superoxide free radicals. These are useful signaling molecules performing useful positive effects. “A small percentage of electrons do not complete the whole series and instead directly leak to oxygen, resulting in the formation of the free-radical superoxide, a highly reactive molecule that contributes to oxidative stress and has been implicated in a number of diseases and aging(ref).” Mitochondrial electron leakage has been studied for a long time. You can go back to the 1993 publication Electron leakage from the mitochondrial NADPH-adrenodoxin reductase-adrenodoxin-P450scc (cholesterol side chain cleavage) system. You can also see (2010) Mitochondrial proton and electron leaks. The normal “electron leak rate” (ELR). from healthy mitochondria is 2%. These electrons that leak out function to create hormetic dose signaling ROS and RNS that have many healthy effects, including the altering of redox sensitive signaling proteins such as Keap-1 and many others. ROS and RNS sensitive “redox proteins” allow for many gene pathways to be upregulated for xenobiotic enzymes and phase II enzymes that protect us from cellular stress. These pathways work well for coping with bursts of increases free radicals and peroxynitrates that occur with acute stresses such as infection, trauma, exercise, etc. See the blog entry Mitohormesis for details on this. Now, with this base of information we go on to effects of aging and certain diseases on mitochondria, electron leakage, and ROS production. There seems to be evidence that lifespans of species are correlated with lower rates of leakage in electron transport chains. Cutting down on mitochondrial electron leakage might be a better strategy for creating mitochondrial health than focusing on mitochondrial antioxidants. 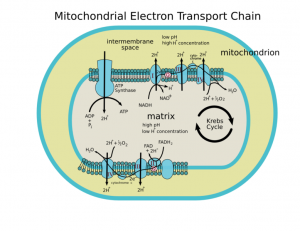 The mitochondrial electron transport chain works less well with aging, and this is associated with increased oxidative damage, in all probability due to increased electron leakage. Further, increasing the efficiency of the electron transport chain can extend lifespansof mice. Earlier publications relating lifespans of rodents to mitochondrial coupling and electron leakage include: Extension of murine life span by overexpression of catalase targeted to mitochondria (2005) and Uncoupled and surviving: Individual mice with high metabolism have greater mitochondrial uncoupling and live longer (2004). Mitochondrial mutations seem highly associated with exceptional longevity across a number of species including our own. Association of mitochondrial DNA haplogroups with exceptional longevity in a Chinese population. Mitochondrial DNA haplogroups in a Chinese Uygur population and their potential association with longevity. A combination of three common inherited mitochondrial DNA polymorphisms promotes longevity in Finnish and Japanese subjects. Absence of association between mitochondrial DNA C150T polymorphism and longevity in a Han Chinese population. Mitochondrial DNA haplogroups associated with age-related macular degeneration. Association of the mitochondrial DNA haplogroup J with longevity is population specific. Mitochondrial DNA haplogroups in Spanish patients with hypertrophic cardiomyopathy. Are mitochondrial haplogroups associated with extreme longevity? A study on a Spanish cohort. Mitochondrial DNA haplogroups: role in the prevalence and severity of knee osteoarthritis. Mitochondrial DNA haplogroups J and K are not protective for Parkinson’s disease in the Australian community. Some variations in the mitochondrial genome are correlated with disease susceptibilities and aging. Mitochondrial haplogroups, control region polymorphisms and malignant melanoma: a study in middle European Caucasians. Mitochondrial DNA content varies with pathological characteristics of breast cancer. Identification of an mtDNA mutation hot spot in UV-induced mouse skin tumors producing altered cellular biochemistry. Mitochondrial dysfunction mediates aldosterone-induced podocyte damage: a therapeutic target of PPARγ. Estrogen receptor mediates a distinct mitochondrial unfolded protein response. Oxygen tension changes the rate of migration of human skin keratinocytes in an age-related manner. The effect of ageing on macrophage Toll-like receptor-mediated responses in the fight against pathogens. Potential therapeutic benefits of strategies directed to mitochondria. Genomic profiling identifies GATA6 as a candidate oncogene amplified in pancreatobiliary cancer. Mitochondrial mutation diseases provide other models of how dysfunctional mitochondria lead to pathologies. Mitochondrial tRNA(Phe) mutation as a cause of end-stage renal disease in childhood, A novel mutation in the mitochondrial tRNA(Ser(AGY)) gene associated with mitochondrial myopathy, encephalopathy, and complex I deficiency. Infantile presentation of the mtDNA A3243G tRNA(Leu (UUR)) mutation. An autopsy case of mitochondrial myopathy, encephalopathy, lactic acidosis, and stroke-like episodes (MELAS) with intestinal bleeding in chronic renal failure. Novel homoplasmic mutation in the mitochondrial tRNATyr gene associated with atypical mitochondrial cytopathy presenting with focal segmental glomerulosclerosis. Reversible infantile respiratory chain deficiency is a unique, genetically heterogenous mitochondrial disease. Mutation of the mitochondrial tyrosyl-tRNA synthetase gene, YARS2, causes myopathy, lactic acidosis, and sideroblastic anemia–MLASA syndrome. Novel mitochondrial DNA mutations associated with myopathy, cardiomyopathy, renal failure, and deafness. Studies of such rare diseases may provide clues as to what is going on in major neurological diseases such as ALS, Huntington’s disease (HD), Multiple Scleroris (MS), Parkinson’s Disease and Alzheimer’s Disease – and even autism. The root cause is thought to be mitochondrial dysfunction resulting from mtDNA damage and leading to excess levels of reactive oxygen and nitrogen species. This point is discussed in the publication Oxidative stress, mitochondrial dysfunction and cellular stress response in Friedreich’s ataxia. “There is significant evidence that the pathogenesis of several neurodegenerative diseases, including Parkinson’s disease, Alzheimer’s disease, Friedreich’s ataxia (FRDA), multiple sclerosis and amyotrophic lateral sclerosis, may involve the generation of reactive oxygen species (ROS) and/or reactive nitrogen species (RNS) associated with mitochondrial dysfunction. 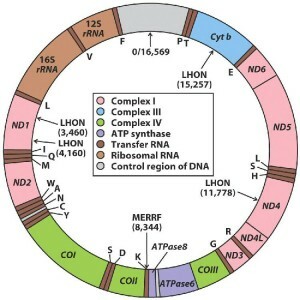 The mitochondrial genome may play an essential role in the pathogenesis of these diseases, and evidence for mitochondria being a site of damage in neurodegenerative disorders is based in part on observed decreases in the respiratory chain complex activities in Parkinson’s, Alzheimer’s, and Huntington’s disease. Such defects in respiratory complex activities, possibly associated with oxidant/antioxidant imbalance, are thought to underlie defects in energy metabolism and induce cellular degeneration. The precise sequence of events in FRDA pathogenesis is uncertain. The impaired intramitochondrial metabolism with increased free iron levels and a defective mitochondrial respiratory chain, associated with increased free radical generation and oxidative damage, may be considered possible mechanisms that compromise cell viability. Recent evidence suggests that frataxin might detoxify ROS via activation of glutathione peroxidase and elevation of thiols, and in addition, that decreased expression of frataxin protein is associated with FRDA. Many approaches have been undertaken to understand FRDA, but the heterogeneity of the etiologic factors makes it difficult to define the clinically most important factor determining the onset and progression of the disease. However, increasing evidence indicates that factors such as oxidative stress and disturbed protein metabolism and their interaction in a vicious cycle are central to FRDA pathogenesis. Brains of FRDA patients undergo many changes, such as disruption of protein synthesis and degradation, classically associated with the heat shock response, which is one form of stress response. Heat shock proteins are proteins serving as molecular chaperones involved in the protection of cells from various forms of stress. In the central nervous system, heat shock protein (HSP) synthesis is induced not only after hyperthermia, but also following alterations in the intracellular redox environment. The major neurodegenerative diseases, Alzheimer’s disease (AD), Parkinson’s disease (PD), amyotrophic lateral sclerosis (ALS), multiple sclerosis (MS), Huntington’s disease (HD) and FRDA are all associated with the presence of abnormal proteins. Among the various HSPs, HSP32, also known as heme oxygenase I (HO-1), has received considerable attention, as it has been recently demonstrated that HO-1 induction, by generating the vasoactive molecule carbon monoxide and the potent antioxidant bilirubin, could represent a protective system potentially active against brain oxidative injury. Given the broad cytoprotective properties of the heat shock response there is now strong interest in discovering and developing pharmacological agents capable of inducing the heat shock response. This may open up new perspectives in medicine, as molecules inducing this defense mechanism appear to be possible candidates for novel cytoprotective strategies. In particular, manipulation of endogenous cellular defense mechanisms, such as the heat shock response, through nutritional antioxidants, pharmacological compounds or gene transduction, may represent an innovative approach to therapeutic intervention in diseases causing tissue damage, such as neurodegeneration.” Italics emphasis on the presence of abnormal proteins is our own since it a theme we will pick up later in this discussion. With mitochondrial mutation diseases, there is an electron leak rate as high as 40% producing much larger volumes of free radicals outside of the hormetic range. Again, it seems that Mitochondrial electron leakage is a smoking gun for ROS production that is highly correlated with disease processes and longevity. In this series of blog posts, we explore the nature of some of those correlations. And we discuss practical intervention strategies. Certain autoimmune and neurological diseases are also characterized by deficiency in electron chain operation, more electron leakage and excessive ROS production. 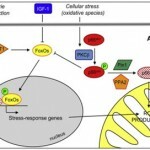 The just-published (November 2012 document Self-evolving oxidative stress with identifiable pre- and postmitochondrial phases in PC12 cells reports: “During the neurodegenerative process in several brain diseases, oxidative stress is known to play important roles in disease severity and evolution. Although early events of stress, such as increased lipid peroxidation and decreased superoxide dismutase, are known to characterize early onsets of these diseases, little is known about the events that participate in maintaining the chronic evolving phase influencing the disease progression in neurons. Here, we used differentiated PC12 cells to identify premitochondrial and postmitochondrial events occurring during the oxidative stress cascade leading to apoptosis. Our data indicate that an acute and strong oxidative impulse (500 μM H(2) O(2) , 30 min) can induce, in this model, a 24-hr self-evolving stress, which advances from a premitochondrial phase characterized by lysosomes and cathepsin B and D translocations to cytosol and early mitochondrial membrane hyperpolarization. This phase lasts for about 5 hr and is followed by a postmitochondrial phase distinguished by mitochondrial membrane depolarization, reactive oxygen species increase, caspase-9 and caspase-3 activations, and apoptosis. Inhibition of cathepsins B and D suggests that cells can be protected at the premitochondrial phase of stress evolution and that new cathepsins regulators, such as glycosaminoglycans mimetics, can be considered as new therapeutic prototypes for neurodegeneration. Insofar as early oxidative stress markers have been related to the early onset of neurodegeneration, strategies protecting cells at the premitochondrial phase of oxidative stress may have important therapeutic applications. Since mitochondria are short-lived and mtDNA is so subject to mutational damage, mitochondrial biogenesis is an important consideration. I have discussed PGC-1α and Nrf2 in a number of blog entries related to mitochondrial biogenesis. 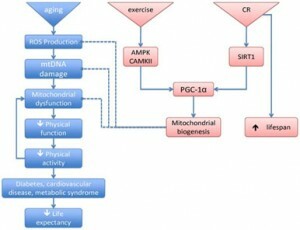 In a June 2010 blog entry AMPK and longevity, I discussed how exercise activates the AMPK pathway and the role of PGC-1alpha (peroxisome-proliferator-activated receptor gamma co-activator-1alpha) as a co-transcriptional regulation factor that induces mitochondrial biogenesis by activating transcription factors. The August 2010 blog entry PGC-1alpha and exercise provides a further and more general introduction to PGC1alpha. I said “You can probably expect to hear a lot about PGC-1alpha as time goes on because this remarkable substance is turning out to have a lot to do with health and longevity. It appears to be the mediator of the health benefits produced by exercise. 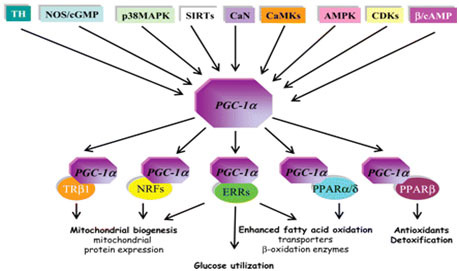 This blog post is about PGC-1alpha, about its relationship to exercise, and about efforts to stimulate it with various substances, in essence seeing if it is possible to provide “exercise in a pill.” And in the blog entry PQQ – activator of PGC-1alpha, SIRT3 and mitochondrial biogenesis I discuss how Pyrroloquinoline quinone (PQQ), a redox cofactor available as a dietary supplement, appears to have at least three central biological effects with powerful downstream health and longevity consequences: it stimulates the generation of PGC1-alpha, results in expression of SIRT3, and induces mitochondrial biogenesis. If there is such a thing as exercise in a pill, it is probably PQQ. Can we affect mitochondrial ROS and health? Mitohormesis is another important concept relating to oxidative stress, health of mitochondria and probably organism longevity. I have devoted a recent blog entry to this topic Mitohormesis, so will devote only a few words to it here. The central concept is that energy metabolism in mitochondria produce reactive oxygen species ROS, due to electron leakage and other factors. At a low level these ROS perform essential cell signaling functions, including triggering of NRF2 signaling which activates the body’s endogenous antioxidant defense system. Numerous health-producing effects result as well as demonstrated longevity-related impacts in lower species. This signaling is a phenomenon evolutionarily conserved across a variety of species. Consuming antioxidant supplements can sometimes interfere with such signaling and have negative biological impacts. 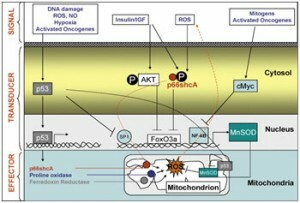 However, if the oxidative stress is to great, such as might be the case due to excessive electron leakage in the mitochondrial electron transport chain due to age-related mitochondrial gene mutations, in that case the benefits of the signaling might be outweighed by the destructive effects of the ROS. In such a case exogenous antioxidant administration might be a good thing. A key to understanding what is going on in hormesis is understanding how the hormetic dose-response curve works, and this can be formulated in terms of NRF2 expression. Graphic depiction of the stochastic hormetic relative risk model as given in Scott et al. (2009). Understanding the typical dose-response curve associated with hormesis is critical for interpreting seemingly contradictory research. In my interpretation, the horizontal axis depicts level of stress, say as driven by ROS load. The vertical axis represents relative risk, level of probable pathological organismic response where normal level is 1. To the left of the first axis crossing in the diagram (point D) the Keap1-Nrf2 pathway is progressively kicking in but not sufficiently so as to overcome the direct negative effects of ROS stress. So, in Transition zone A there is under-expression of the ARE genes and a negative health condition Between stress levels b and D*** there is hormetic protection compared to what would be expected given a linear model of negative response to stress and better-than-expected health, due at least in part to activation of Nrf2 and the ARE genes. The zone of maximum protection is between D* and D**. Starting at D** to D*** the stress load begins to overwhelm the defensive activities of the ARE genes and the protection becomes less and less until at point D*** the hormetic response associated with ARE gene activation becomes negligible. In the case of radiation damage at least, beyond point D*** the damage according to conventional wisdom is in linear proportion to the stressor, the amount of radiation. 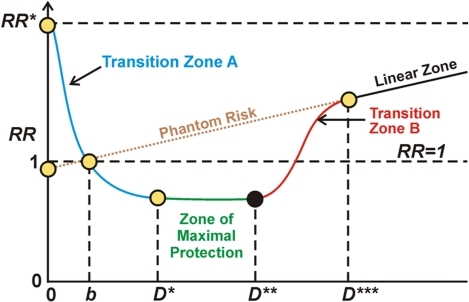 Phantom risk is theoretical risk for low stress levels that would apply if the linear model were extrapolated for low stress dosages. For further discussion of this curve and aspects of Mitohormesis, please see the Mitohormesis blog entry. This blog entry summarizes some basic information about mitochondria, some found in textbooks and some not. By now it should be clear that mitochondria play central roles related to biology in general, health and longevity. This blog entry is only the appetizer with the main course to follow. As I now see it, the next blog entry in this series, Mitochondria Part 2: mitochondrial pathways, diseases and aging will dig deeper and examine underlying pathway mechanisms for observed disease and aging effects. We will touch upon the sources and natures of mitochondrial stress. We go some into mitochondrial-nuclear signaling and the mitochondrial UPR (unfolded protein response), the roles of mitochondria in UPR in the endoplasmic reticulum, and into signaling transport mechanisms such as microtubules and motor proteins. And we will speculate on a possible underlying mitochondrial cause common to aging and age-related neurological, cardiac and other diseases. As I see it now, a Part 3 blog entry will focus on practical interventions. It will review what is known about the impact of administration of key mitochondrial antioxidants, alpha-lipoic acid, acetyl-l-carnitine, melatonin and buckyballs. And we will speculate on how further research needs to be directed to answer critical outstanding questions. This is interesting — but some of the figures showing mitochondrial systems are too blurry to read on my computer. I look forward to seeing the future posts on this subject — hopefully with readable figures. Thanks for the feedback. I had a problem getting adequate resolution on some of the images Jim Watson sent me in a PowerPoint presentation he was putting together. Getting them online was an awkward multistep process. I will see if I can upgrade the images and take measures to assure that future images are fully readable. We are working on the Part2 posting in this blog series, and I think it will include some exciting stuff.